Today I’m reviewing one of our latest rivals on DavidNews.com HYIP monitor, a program called Chain Group Service. It’s another crypto currency trading project. This HYIP joined Standard listing on DavidNews.com 7 days ago. It’s hard to understand what’s the age of this program. Therefore, I searched for discussions on a forum and found one with the first comment on the 23rd of July 2017, which makes it almost three weeks old. Now I have reinvested in this HYIP $200 and will monitor the performance of this program in the following hours, days and weeks. Let’s find out more about this program. Chain Group Service website looks interesting because I felt like traveling back in time. It’s not about old-school graphics or functionality, but more about the simplicity of the web design and functions. I mean, it’s like a remake of an old web design in terms of simplicity, but with the new trends and layout in mind. First, navigation items with underline elements. Second, gif animation fills most of the area on the top of the page. In the meanwhile, there is also a video explainer, which provides more information about this program. I must admit, it’s also an example in terms of minimalistic design because lately, I haven’t seen websites with so much empty space. We all know it has nothing to do with the performance of the program in the long term. However, the admin has achieved the goal if it was to make the website look like it was built a while ago. What’s the story of Chain Group Services? It is being positioned as a program for those who want to make money on cryptocurrency exchanges. Moreover, right on the home page, there is a message that claims it’s a great idea. Ironically, but admin is not recommending us (website visitors) do it ourselves. I’m sure that among DavidNews.com readers there are some crypto currency trades that have a different opinion. However, the main idea is that there are 4 different trade groups offering different investment rates. I will go into details later about investment plans but keep in mind this terminology to understand what’s what. Basically, each registered user is joining a trade group after the deposit is made. Most interesting fact is that on the FAQ page admin claims that Chain Group Service have only one investment plan. All other investment offers are third-party. 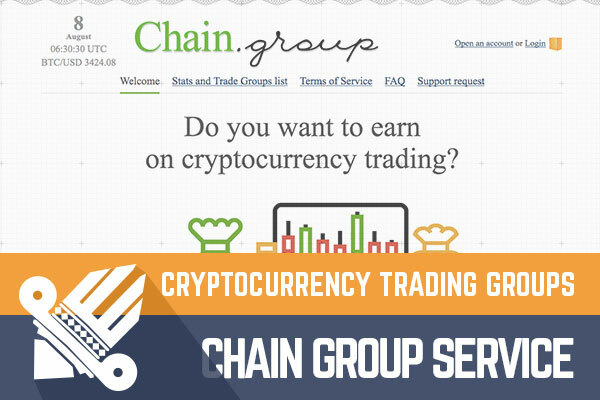 These Trade Groups are served by Chain Group, but the HYIP does not own and does not manage them. From this, I understand that it’s even more complicated than a standard HYIP because the admin has responsibility only about one of the plans (trading groups), but all other plans do not belong to the Chain Group Servicces. Sure, if we think with a clear mind it is clear that admin manages all trading groups, but eventually, I think it is an interesting way how the project is presented to people. There are 4 different plans available with floating and fixed rates from 0.1% up to 6% daily. All of them look like the long-term deposits because their term varies from 180 to 500 days. Minimum investment on all 4 plans is in the range from $5 to 10. The most attractive plan is Dragon Foundation with floating rate 0.1 to 6% daily because from the floating rate graphic it looks like it’s average rate has been around 3%. Deposit of $200 with average 3% daily rate would make approximately $6 a day, which should result in a profit of $880 at the end of the term. Of course, it’s only a calculation based on the hypothesis that this program will last that long. Examine all investment plans, because there are also other variables like early principal withdraw option with fee and compounding. Just a little insight to registered user dashboard – it’s not much different from the main website area with the minimalistic old-school design. First, registered user must add funds. There are 4 different payment systems available for adding funds – AdvCash, PerfectMoney, Payeer, CoinPayments (for Bitcoin and other cryptocurrency deposits). In the next step, the user must specify the desired amount of the deposit. Like usually, the user can proceed to make the first deposit when funds have been added to the account. Withdraw process looks very similar – choose the payment option, the desired amount to withdraw and submit the request. Please keep in mind that there is also withdraw fee 0,5%. Minimum withdraw amount is $1, but there is no maximum amount. Withdraw can take up to 24 hours. At first glance, I was excited about the unusual web design example. However, at the end, I realized that it’s very hard to understand what’s what. First, this HYIP claims that they have only one plan, but 4 plans are offered. Second, most of the plans have floating rates. Third, there is 0.5% withdraw fee. Fourth, the age of the HYIP and date of trading group establishments vary. If you check T.G. Thomas & Others it’s almost 3 months old, but the HYIP itself is less than a month old. Even though a number of investors and potential profit look fine, there are all these above-mentioned peculiarities, which make me very curious. Of course, I don’t expect any HYIP to provide me a guarantee due to the nature of this industry, but in this case – admin claims that there is only one investment plan provided by this HYIP. The question, who is providing other plans? In most cases, one admin decides when to stop the program. Here we might have 4 admins. As usual, I’m here not to recommend any program, but to collect information and express my opinion about each program. Therefore, if you ever decide to make any investments, don’t invest more than you can afford to lose! Investment plans: 0.1% up to 6% daily for 180 up to 500 calendar days. Various investment conditions, more in the review. 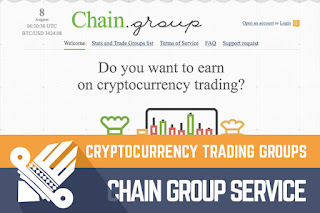 Join Chain Group Service Here!